Children 17 and under are free, but must be accompanied by an adult. An annual tradition for more than thirty-five years continues with the Trail End State Historic Site’s annual Open House, a three-day holiday celebration from 4 p.m. to 7 p.m., December 7-9. Admission is $2 for adults. Children are admitted free of charge, but must be accompanied by an adult. The Holiday Open House is sponsored by the Trail End Guilds. This old-fashioned holiday celebration features live music and tasty treats served up in a historically elegant atmosphere complete with all the traditional trappings of the season. 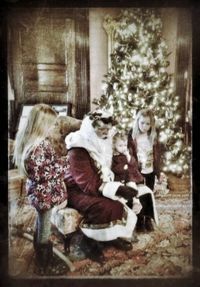 The holiday decorations placed about the spectacular 1913 Kendrick Mansion provide the perfect backdrop for a special appearance by Father Christmas, who will be on hand all three days. Throughout the event, audience members are invited to take a seat in the mansion’s historic Drawing Room where they can enjoy musicians and singers in a casual, non-concert setting. Scheduled to perform are: Dec. 7 – 4 p.m., Alex Banks; 5 p.m., Cathy Storm; and 6 p.m. Cheryl Sinclair Dec. 8 – 4 p.m., Just Harmony; 5 p.m., Steve & Cathy Singalong; and 6 p.m., Patchwork Singers Dec. 9 – 4 p.m. & 4:30 p.m., Bells of the Big Horns; 5 p.m., Sam Hoffman; and 6 p.m. Terry Garrison Trail End Guilds President Steve Baskin notes that the Holiday Open House is his group’s gift to the community to thank them for their support throughout the year: “The Open House has grown to be not just a community tradition, but a family one as well. We have people who came here as children thirty years ago who are now bringing their own children. We love seeing the old faces – as well as all the new ones.” For more information on the Holiday Open House, please contact Trail End at 307-674-4589 or via Facebook.